"Well, my book is written -- let it go. But if it were only to write over again there wouldn't be so many things left out. They burn in me; & they keep multiplying & multiplying; but now they can't ever be said. And besides, they would require a library -- & a pen warmed up in hell." Samuel Clemens's interest in writing A Connecticut Yankee in King Arthur's Court was sparked, in part, by Thomas Malory's book Le Morte d'Arthur given to him by George Washington Cable in December 1884. Centered around a time traveler who goes from 19th-century Connecticut to 6th-century England, the book is a satire and social commentary against institutions and ideology that support monarchy, slavery and organized religions. 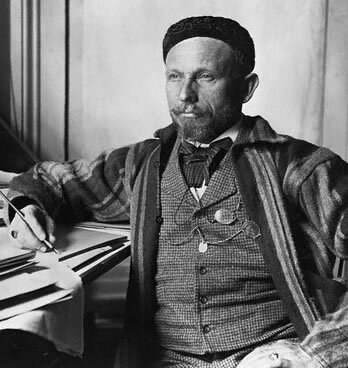 Clemens spent about four years writing the novel and completed the manuscript in April 1889. The novel consists of about 119,000 words including a preface, prelude and 44 chapters. 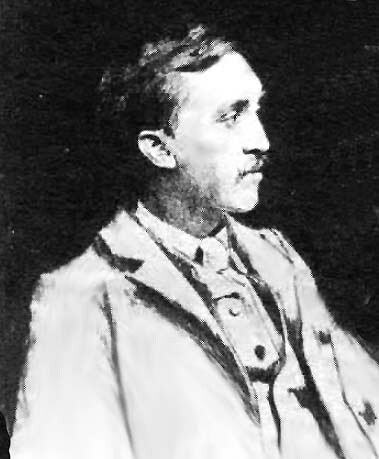 Charles Webster had left Webster and Company in 1888 and the book's production was supervised by Frederick J. Hall (b. 1860 - d. 1926). Daniel Carter Beard was hired for $3,000 to illustrate the work. Daniel Carter Beard (b. 1850 - d. 1941) was born in Cincinnati, Ohio. His father, James Henry Beard, was a portrait artist and member of the National Academy of Design. Daniel Carter Beard was an avid outdoorsman, author and illustrator. In Ohio he studied civil engineering and later worked for the city of Cincinnati. In 1874 he worked with the Sanborn Map and Publishing Company. In 1878 the Beard family moved to New York where he studied at the Art Students League. At age twenty-eight he began a successful career as a freelance commercial artist. Connecticut Yankee was his first Mark Twain project. 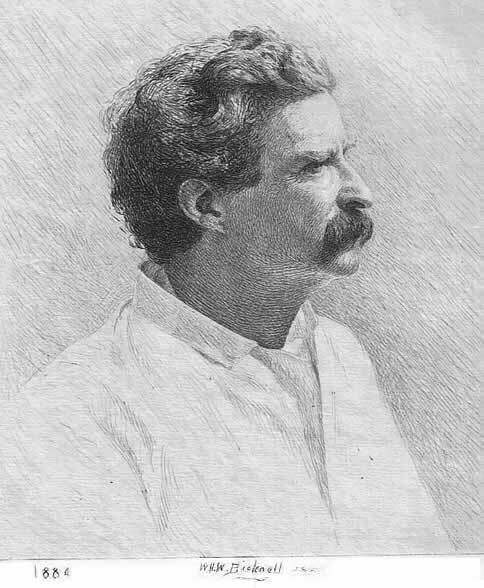 He would later illustrated other Mark Twain works including The American Claimant (1892); "The £1,000,000 Bank Note" (1893); "The Esquimau Maiden's Romance" (1893); "Traveling with a Reformer" (1893); and Tom Sawyer Abroad (1894). By 1894 Beard was also teaching drawing at New York's School of Applied Design. Beard provided more illustrations for the 1897 edition of Following the Equator than any other artist. In 1905 Beard became editor of Recreation magazine and founded the Sons of Daniel Boone, a group he merged with the Boy Scouts of America in 1910. Clemens once described Beard as "the only man who can correctly illustrate my writings, for he not only illustrates the text, but he also illustrates my thoughts" (Rasmussen, p. 589). For A Connecticut Yankee, Beard drew about 400 illustrations in 70 days; 220 were selected for publication. According to Mark Twain scholar, Beverly David, "Beard expanded and elaborated upon Twain's ideas in many cases, frequently investing his drawings with a fiercer rhetoric than Twain employed in the text" (David and Sapirstein, 1996). Beard also used faces of recognizable public figures for the faces of Twain's characters including Queen Victoria as a "troublesome sow" and financier Jay Gould as a sadistic "Slave Driver." Beard's drawings depicting a cleric controlled by Satan along with other caustic images related to religion were potentially offensive to churchgoers. Clemens supported Beard's interpretations writing him, "to my mind the illustrations are better than the book -- which is a good deal for me to say, I reckon" (David and Sapirstein, 1996). He also wrote Beard, "There are hundreds of artists who could illustrate any other book of mine, but there was only one who could illustrate this one. Yes, it was a fortunate hour that I went netting for lightning-bugs and caught a meteor. (Paine, p. 888). However, Clemens and Fred Hall were aware of the power of the illustrations to offend and when the second sales prospectus was being prepared for the book, they considered leaving out anything that might offend the church and include only illustrations related to ridiculing royalty and nobility. In November 1889 Century Magazine published an illustrated extract from the work. Webster & Company issued the book on December 12, 1889. Andrew Chatto issued a British edition the next day under the title A Yankee at the Court of King Arthur. According to Beard, powerful Catholic representatives found the book offensive, especially his illustrations. Beard wrote, "my work was boycotted for many years by all the prominent magazines, with the exception of Life and Cosmopolitan. I, too, went practically broke" (Beard, 1939, p. 338). When Webster and Company went bankrupt in April 1894, Harper and Brothers acquired the rights to A Connecticut Yankee in King Arthur's Court in May 1895. Harper later issued an edition of it in their red cloth cornstalk bindings with only 24 of Beard's less offensive original illustrations. By 1924 when Harper's again published the book in the red cloth cornstalk binding, the number of Beard's illustrations had been reduced to only 16. It would be another 50 years before Beard's original illustrations would be restored into the text when the University of California Press published the book in a scholarly edition in 1979. In an agreement between Harper and American Publishing Company, dated December 31, 1896, American Publishing Company acquired the rights to include A Connecticut Yankee in King Arthur's Court in their 1899 uniform edition of Mark Twain's works. Under a second agreement dated November 11, 1898 Frank Bliss was allowed to manufacture new printing plates that would immediately become the property of Harper and Brothers. By producing a new set of plates in Hartford, Bliss could save transportation costs and insurance involved in shipping the plates from New York. The 1899 uniform edition of A Connecticut Yankee offered Clemens an opportunity to revise and refine his work. However, there is little evidence to suggest he took an active interest in doing so. Production of the new 1899 plates had the potential to introduce inconsistencies into the texts that were the result of typesetting errors. Suppose Sir Walter, instead of putting the conversations into the mouths of his characters, had allowed the characters to speak for themselves? We should have had talk from Rachel and Ivanhoe and the soft Lady Rowena which would embarrass a tramp in our day (Twain, 1899). Morgan immediately spotted an error. He wrote, "This is awful--there is no Rachel in Ivanhoe." Scott's character's name was Rebecca. Frank Bliss notified Clemens and Clemens gave the order to correct the name to Rebecca in future editions (Twain, 1979). The first corrected version appeared in the 1901 Riverdale and Underwood editions. Frank Bliss returned to Dan Beard to provide the illustrations for the 1899 uniform edition of A Connecticut Yankee in King Arthur's Court. Beard reworked five of his original full-page illustrations providing background details and shading. Bliss chose to reuse one original full-page illustration from the first edition without any touchup or revision. None of the six full-page drawings contained content that could be interpreted as offensive to religion. 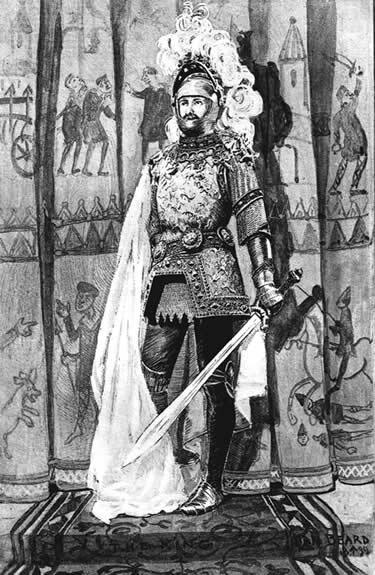 One of the most interesting revisions is Beard's illustration for King Arthur. As noted by Mark Twain scholar, R. Kent Rasmussen, "The picture of King Arthur facing p. 242 has its own strangeness. The curtains added to the background appear to have scenes copied from the Bayeaux Tapestry -- a mural depicting the 1066 Norman conquest of England that was created several centuries after the event. A helluva anachronism for 6th-century King Arthur. The entire tapestry can be seen here : http://www.bayeuxtapestry.org.uk/Bayeux1.htm" (Rasmussen, 2009). 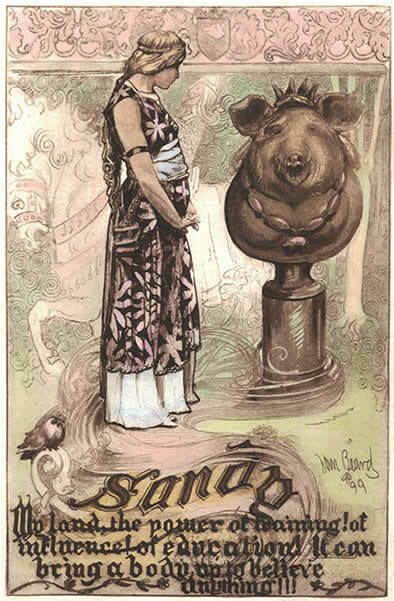 One of Beard's new illustrations depicting Sandy's curious delusion of pigs as royalty was hand-colored and used as the frontispiece for the 1901 Riverdale edition. On December 21, 1905 at a dinner given by the Society of Illustrators in New York at the Aldine Association Club honoring Clemens, he gave a speech which contained praise for Dan Beard's work. The artist, the illustrator, does not often get the idea of the man whose book he is illustrating. Here is a very remarkable instance of the other thing in Mr. Beard, who illustrated a book of mine. You may never have heard of it. I will tell you about it now -- A Yankee in King Arthur's Court. Now, Beard got everything that I put into that book and a little more besides. Those pictures of Beard's in that book -- oh, from the first page to the last is one vast sardonic laugh at the trivialities, the servilities of our poor human race, and also at the professions and the insolence of priestcraft and kingcraft -- those creatures that make slaves of themselves and have not the manliness to shake it off. Beard put it all in that book. I meant it to be there. I put a lot of it there and Beard put the rest (Fatout, pp. 473-474). Beard, Dan. Hardly A Man Is Now Alive. (Doubleday, Doran and Company, Inc., 1939). David, Beverly and Ray Sapirstein, "Reading the Illustrations in A Connecticut Yankee." In Mark Twain, A Connecticut Yankee in King Arthur's Court. (Oxford University Press, 1996). David, Beverly. "The Unexpurgated A Connecticut Yankee; Mark Twain and His Illustrator, Daniel Carter Beard," Prospects, 1975, pp. 99-117. _____. Personal correspondence regarding Bayeux tapestry, 23 May 2009. Smith, Henry Nash and William M. Gibson, eds. Mark Twain - Howells Letters, Volume I. (Belknap Press, 1960). Twain, Mark. A Connecticut Yankee in King Arthur's Court. Edition De Luxe. (American Publishing Company, 1899). _____. A Connecticut Yankee in King Arthur's Court. The Works of Mark Twain. Bernard L. Stein, ed. (University of California Press, 1979). _____. A Connecticut Yankee in King Arthur's Court. (Oxford University Press, 1996).